Despite repeated face lifts, Marienlyst is one of the most holistic Danish architectural masterpieces from the 18th century. It was originally built in 1587 as a summerhouse for King Frederik II, who lived at Kronborg Castle. A French architect named N.H. Jardin retained the towered building but added a wing on each side and converted the out-of-context renaissance garden into a baroque garden to match the building perfectly. The garden preserved its structure as a room" with a floor of grass and gravel, symmetrically framed by lime tree avenues. Simple and elegant. " Marienlyst's original building and garden was located at the foot of a steep slope. This gave limited options but resulted in an unusual harmony of house and garden. After the renaissance facelift, the lateral axis between the two entrances through the garden wall were preserved and the garden retained the enclosed space of the renaissance style. The perspective of the previous baroque garden was dispensable because a terrace on the roof gave a clear view of the Sound. 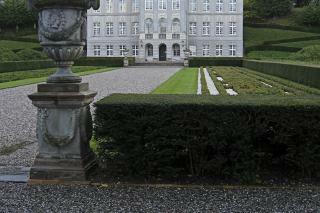 Crown Prince Frederik and landscape gardener Johan Ludwig Mansa remodelled the back garden along English style" lines in about 1790 but did little to the baroque garden. In 1926, G.N. Brandt reinterpreted Jardin's garden, restoring it in a way that ensures it retains its simplicity and elegance to this very day. "